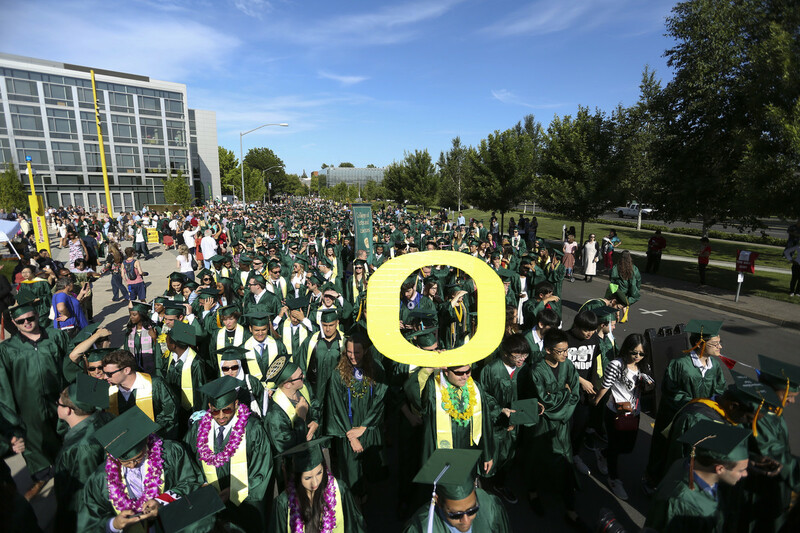 On June 13, several thousand UO students will don caps and gowns, stroll through campus to Matthew Knight Arena for commencement ceremonies, and a short while later, emerge as graduates of the University of Oregon. Many will continue their academic adventures in graduate school, while many others will move on to the first phase of their professional careers. Wherever they go, we wish them well. They'll take with them more than diplomas. They'll have the memories of special times and places as well as the lessons taught both inside and outside the classroom by faculty mentors, by campus advisors and by friends. In these stories you'll get a glimpse into a few of those memories and of the courses being charted by the Class of 2016. "I’ve learned that the things that make you different and that you’re passionate about are some of the best things you have to offer to the world." — Meet Kate Rohrich, class of 2016, drum major and fan of long road trips. "Being a Duck means being a part of a family that will be with you for the rest of your life." "What I have learned is dream, plan, work with commitment and passion, then you will achieve what you want." "Ducks stick together, we are all family. No matter where we go in life, we will always be Ducks." "I think that what I learned is really how to think creatively vs. create skillfully. Learning that the concept behind the artwork needs to be on par with the technical skills that you bring to the idea is really important."